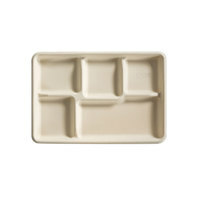 Many of these school trays come with compartments so you can serve entrées, sides, and desserts on the same dinnerware. They're also lightweight so younger students can easily carry them without dropping them. 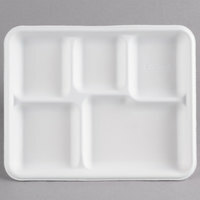 Plus, since they're made of foam, these school food trays boast excellent temperature retention to help foods stay at the proper temperatures when they're in use. Also make sure to check out other great items from EcoChoice, CKF Inc., Genpak and Huhtamaki Chinet. 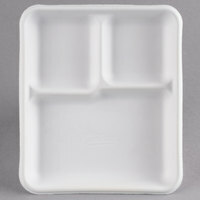 These school trays are convenient and easy to use, making them great for your fast-paced service environment. Choose from styles that are microwave safe so you can easily reheat contents all on the same dish. We also have environmentally friendly pulp trays for schools or establishments who have adopted a sustainable operating system. To make your serving line run smoothly, be sure you're prepared with the appropriate serving utensils. Also, stock condiment stations with dispenser napkins and straws so students have everything they need for their lunches. 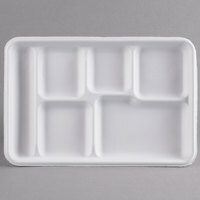 If you're wondering where to buy huhtamaki chinet foam school trays and pulp school trays, we have a large selection of huhtamaki chinet foam school trays and pulp school trays for sale at the lowest prices.